Novelist, short-story writer and the first Black woman in South Africa to publish a novel. Miriam Tlali was born in Doornfontein in Johannesburg, Transvaal (Gauteng). She grew up in Sophiatown. Miriam wanted to study literature at the University of the Witwatersrand but was not admitted due to the reservation of positions for White students. She later went to study at Pius the XII University (now University of Lesotho). Unfortunately she couldn’t complete her studies due to financial difficulties. No longer able to study, Tlali found a job as a bookkeeper at a furniture store. In 1969, Tlali had written and completed a novel titled Muriel at Metropolitan, a semi-autobiographical work. The novel was only published six years later in 1975. It was the first novel written by a Black woman to be published in South Africa. In 1979, the novel was banned by the Apartheid government; however, it was published internationally under the title Between Two Worlds by Longman African Classics. In 1980, Tlali published her second novel Amandla (meaning Power) which was based on the 1976 Soweto uprising. Sadly the novel was banned only weeks after it was published. Just like her first novel, Amandla was translated into several languages, including Japanese, Polish, German and Dutch. Both novels were unbanned in 1986. In 1984 she wrote a collection of short stories, interviews and non-fiction titled Mihloti (meaning tears). In 1989, Footprints in the Quag (initially titled Soweto Stories) was published by Pandora Press. As an author Tlali has travelled the world and represented South Africa in several countries. In 1978 she was invited to an international writing programme at Iowa State University in the United States of America. Between 1989 and 1990, Tlali was a visiting scholar at the Southern African Research Program at Yale University. For her contribution to the literary profession, Tlali has received many accolades, including being honoured by the Department of Arts, Culture, Science and Technology for being the first Black woman to publish a novel. In 1995, the Department also honoured her with a Literary Lifetime Achievement Award and in 2008; she received the Presidential Award, Ikhamanga Silver. Tlali’s founded the publishing house Skotaville. As a member of the Women's National Coalition, Tlali assisted in drafting the Preamble to the South African Women's Charter. 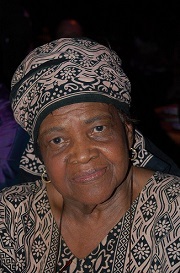 In 2013, Tlali celebrated her 80th birthday. She is reported to be writing her autobiography.